If you purchased a new property recently, you’d know that the renovation process can be distressing. Horror stories from others’ past renovation experiences may intimidate you; however, you know that you can’t move in without getting some basic work done, and so you proceed with caution. What if today, you were told that you’d be able to sign off on a renovation package with up to $50,000 of your renovation deposits protected? This is the assurance given to homeowners who engage interior designers from renovation platform Qanvast, following a quote request. Apart from the $50,000 Qanvast Guarantee, Qanvast can also be your go-to mood board for renovation ideas; unlike social media apps like Pinterest where you are exposed to international trends and designs, you get to look at local examples – be it a HDB flat in Yishun or a landed property in Queen Astrid Park. 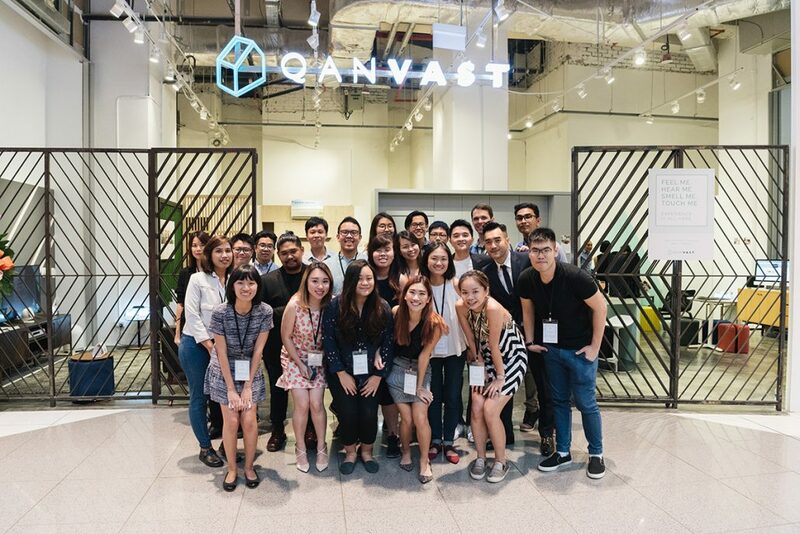 In this conversation with Madeline Chen, Marketing Manager at Qanvast, we take a deeper look at some frequently asked questions related to home renovations (such as the necessity of hiring an interior designer) and more. The Redbrick Team (RB): Tell us more about Qanvast. When and how did Qanvast come about? Qanvast (Q): Before Qanvast, homeowners turned to friends and family, events, or interior magazines to get recommendations for interior designers. Downside is, you get to know only a few names, and the firms featured in magazines are only those that have the budget to advertise. At that time, what was lacking was a platform showcasing the portfolios of various interior firms, and where homeowners could browse local home designs. We also noticed that there were many smaller, capable interior firms out there that were left unnoticed. Hence, we married the two concepts, and then defined the brand principles that helped to further cement Qanvast as the renovation platform that inspires trust and simplifies your renovation journey. We also have a library of useful and practical renovation ideas and guides to educate homeowers on the subject of renovation, which is a fairly unfamiliar topic, especially for first time homeowners. 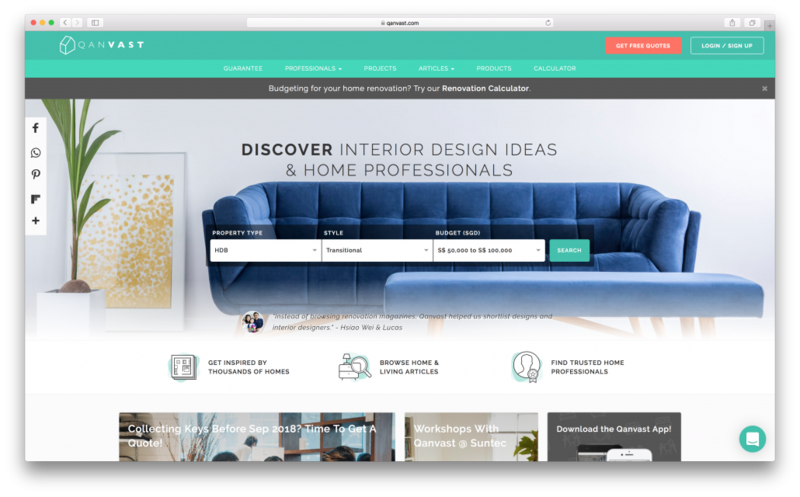 This empowers homeowners to go into their renovation knowing what to expect, make educated decisions regarding their interior design, and take ownership over their renovation, rather than leaving all the decision-making to the interior designer. Ultimately, we wish to inspire, educate and empower homeowners, and at the same, improve the quality of interior services the firms provide. 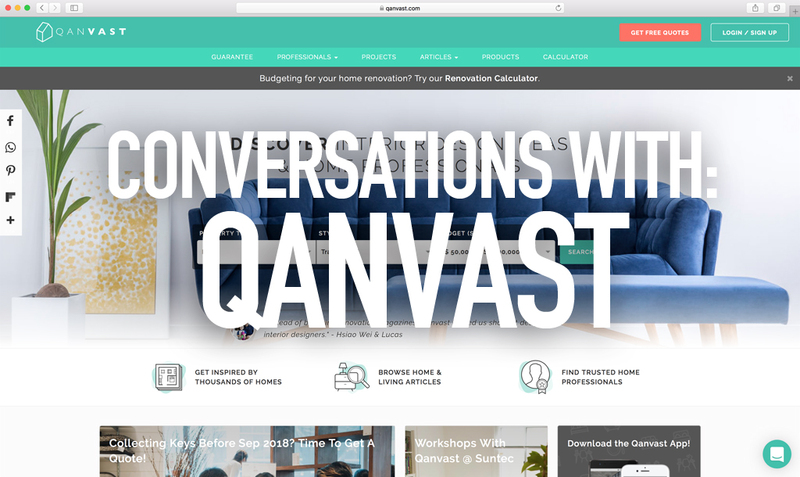 RB: Why should home owners go to a renovation portal like Qanvast? Q: Popular sites like Pinterest, and even Instagram are great ways for homeowners to search for home inspiration, but Qanvast provides homeowners with local home images, which may be more relevant in terms of structural layouts. These images come complete with renovation costs and a breakdown of the works involved. RB: Is it a must to hire an interior designer? Q: It’s not a must, but generally, homeowners would prefer to let the pros handle the project management aspect as it can be a nightmare to coordinate between your carpenters, plumbers, painters, tilers, floor and materials suppliers, air-con guys and electricians. Furthermore, interior designers have the technical knowledge to clearly instruct contractors on the works to be done. On top of that, they understand the building regulations and guidelines, permits required and even the order of the works to be done. More budget conscious people can turn to contractors – but since they will be playing the role of interior designer, they should be clear on what they want, and the technicalities involved in a renovation. RB: What sets Qanvast apart? Q: There’s a lack of trust in the renovation industry and we stand firm on the principle of building trust. We levelled the playing field by featuring both small boutique firms and established ones on one platform, offering more choices to homeowners. Unlike other platforms, we only showcase actual home photos instead of 3D drawings, along with the project costs and works involved for added transparency. 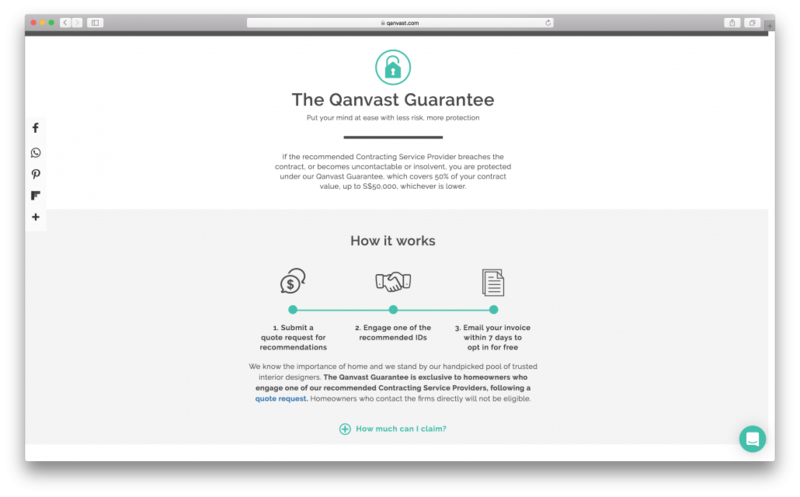 We also launched Qanvast SuperTrust, where we award a firm’s credibility based on the number of homeowners on Qanvast who engaged their services, and had positive reviews. Standing by our pool of interior designers, the Qanvast Guarantee came shortly after – an in-house initiative to assure homeowners of the firms we recommend via our quote recommendation services. RB: How do ID firms get their services listed on Qanvast? Q: Firms pay a subscription fee, and can choose to subscribe to our recommendation services, depending on the firm’s resources. We have in place a screening process – this means at times we will have to turn down the firm if they do not fulfil our selection criteria. It’s an ongoing process, even when the firms are onboard, as we get feedback from homeowners on the quality of their services. RB: What advice would you give home owners who are renovating for the first time? Q: Do your research and know what are the design ideas you like and dislike, instead of throwing the design conceptualisation to the designer and hoping he or she would fully understand your requirements and preferences. It can be quite tiring after speaking to 3-5 interior designers so be sure to have a clear idea on your brief so that you don’t get swayed easily and regret later. Also, try not to meet only one interior designer; meet about 3-5 designers and observe their communication style, project management, working style, and whether you have chemistry with the designer. These are important, especially once the renovation process starts – nobody wants to work with an interior designer that provides impressive designs at the start but has a hard time communicating with you or managing the sub-contractors, resulting in delays after delays. RB: What are some of the biggest home renovation trends today? Q: Trends come and go so it’s hard to put a finger to it. Two years ago, it was the raw, industrial, edgy vibe. Today, people are going for a clean, uncluttered minimalist look, or an evergreen contemporary style. And the ever-popular design request – to have more storage at home. RB: What are homeowners’ behaviours towards renovation like today? Q: Previously, homeowners left the design conceptualisation mainly to the interior designers. Today, with the strong proliferation of social media, homeowners are savvier and want to have a say in their home design. The younger homeowners will put together a mood board on what they like and get the designer to refine those ideas, or counter-propose them with better suggestions. No longer will they want a house that looks exactly like their neighbour’s. It’s about injecting personality and character into their home. The working dynamics between the homeowner and designer is also very different as designers are constantly being challenged to produce unique designs, while dealing with trickier requirements. RB: Tell us more about the Qanvast Guarantee. How does that work? Q: The Qanvast Guarantee initiative applies to three scenarios –the interior firm breaches the contract, becomes uncontactable or insolvent. It covers up to 50% of your contract value or S$50,000, whichever is lower (read more here). These are common renovation horrors we have heard or read about in papers. The Guarantee seeks to assure homeowners on the pool of firms we recommend via our quote recommendation services. RB: Have there been cases of home owners seeking recourse through Qanvast Guarantee so far? Q: We take pride in our screening process so fortunately none of our homeowners are faced with the need to use the Qanvast Guarantee. RB: What are Qanvast’s plans for growth like? Q: We do see a lot of potential for growth locally and regionally. The renovation industry can be better regulated and we look forward to see how we can support, or even champion new initiatives like our Qanvast Guarantee. Still unsure if you need to go through a renovation platform? Well, there’s no harm trying to see for yourself, right?